New Web Series "Music from Somewhere, Maine" to be filmed in West Paris. 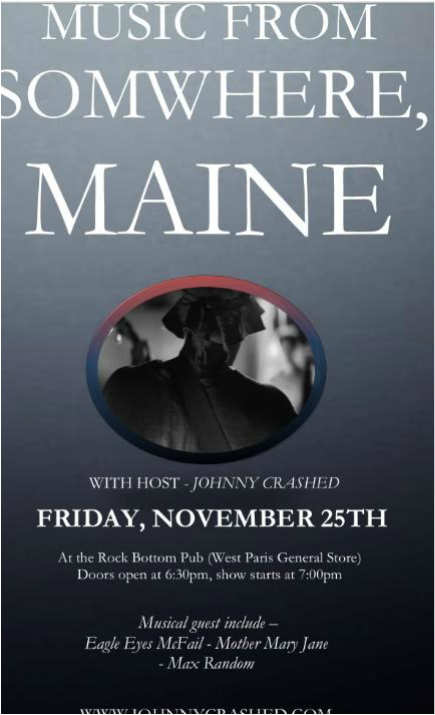 Local songwriter and storyteller Johnny Crashed will host the first taping of "Music from Somewhere, Maine" a new monthly web-series being filmed at the Rock Bottoms Pub. (West Paris General Store). The show will feature songs and stories inspired by his ten years of his life as a marijuana farmer, as well as special musical guests from Oxford Hills and beyond. The first show is set for Friday, November 25th. Doors open at 6:30. Show begins at 7pm. For more information please go to www.johnnycrashed.com. Johnny Crashed is a writer, musician, political organizer, and owner of Open Sky Farm, the first legal marijuana farm in the state of Maine. He has released six CD's of original music over the last fifteen years, including "God, Guns, and Ganja" and "The Trial of Johnny Crashed". He has had a full length novel written about him and his farm, represented himself in over six court trials, and left enough time to bring two daughters into this world. His best friend is his German Shepard, Sam.